Home > Competitions > Win tickets to the MHM Great War Debate! Win tickets to the MHM Great War Debate! This month we have two tickets to the MHM Great War Debate to be won! 61 Whitehall, London. This prestigious and historic Grade II listed building is the venue for this exciting event. 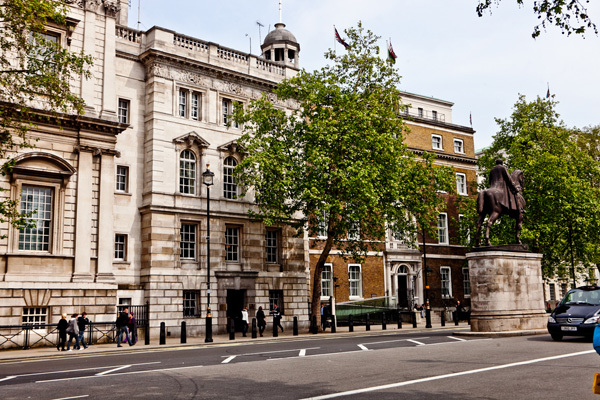 Built on the site of what was Henry VIII’s private bedchamber at the old Whitehall Palace, it is surrounded by many famous landmarks including The Cenotaph, Downing Street, The Cabinet Office, and Horse Guards Parade. To celebrate our 50th issue, MHM is putting on an unmissable event for enthusiasts for military history. In conjunction with Historical Trips and hosted by the esteemed Royal United Services Institute (RUSI), Military History Monthly is holding a live debate to try to settle a dispute historians have been arguing over for 100 years: should Britain have fought the First World War? Proposing that the First World War was a necessary sacrifice, a war for peace and security, are Patrick Mercer and Nigel Jones. They will face Neil Faulkner and Jan Woolf, who will argue that the conflict was just futile slaughter, a war for empire and profit. Join the MHM team and other MHM readers to hear these widely recognised military history experts go head-to-head. The audience will have the chance to give their own views on the subject, so be sure to prepare searching questions to test the speakers. At the end of the event there will be a drinks reception, at which the results of the debate will be revealed. This exciting event will be held at at 6:30pm on 27 October, at the prestigious venue of 61 Whitehall, London, SW1A 2ET. Steeped in history, this Victorian grade II listed building sits on the site of what was Henry VIII’s private bedchamber in the Tudor wing of the old Palace of Whitehall, which was destroyed in the fire of 1698. For more information on the event itself, and for full biographies on all the military history experts speaking, click here. This competition is now closed, however you can still purchase tickets in advance of the event for just £10 – call 020 8819 5580.